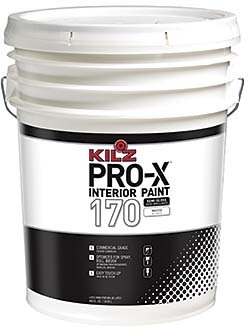 A 5-gallon can of Kilz Pro-X 170 semi-gloss covers up to 2,000 square feet and is applicable by brush or roller. The latex maintains its finish in high-moisture environments such as kitchens, bathrooms, doors, and high-traffic surfaces. The paint is available in three sheens — interior dead flat, eggshell, and semi-gloss — and is designed for use on drywall, concrete block, masonry, metal, wood, cured plaster, architectural plastics, and poured concrete.